We’re continuing on with Pievember, folks! Today, it’s one of my all-time favs, coconut cream pie. I have a confession. I love making pie crusts and flaky pastry. But if you give me a choice between a cream pie with a cookie crust and a pie with traditional pie crust, I’ll probably choose the cream pie. I LOVE cream pie, in any way, shape, or form. It’s just my jam. Now, I’ve heard that some people don’t like coconut. And that’s totally fine! But if you don’t like coconut, this pie isn’t for you. 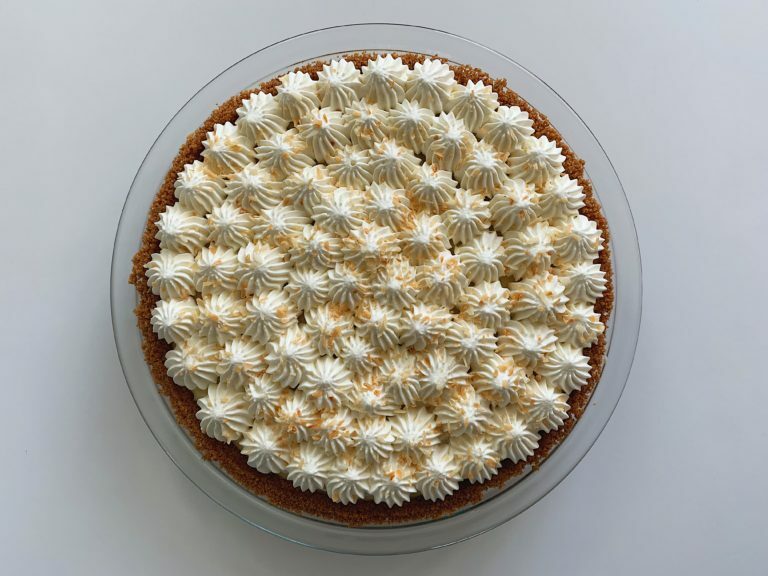 On the other hand, if you love coconut, you’re going to die over this pie! Let’s all be coconut lovers and make this pie, okay? I know it sounds intimidating to make a a coconut cream pie from scratch. 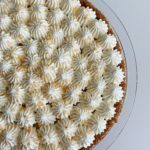 But this pie can be simplified into three steps: crust, pastry cream, and whipped cream. The crust is easy. All you have to do is crush some graham crackers, add sugar, then melted butter. Then smoosh it into a pie plate and bake for a few minutes. Pastry cream is a little more work, but nothing that’s not attainable. I’ll go over the steps in the recipe. It mostly involves a bunch of whisking. We can do that, right? And then, the whipped cream. So easy, people! You can make the crust and the pastry cream the day before Thanksgiving, if you’d like. But you’ll want to make the whipped cream right before you serve the pie. I hope you add this one to your Thanksgiving lineup! This pie is perfect for any coconut lover in your life. In the bowl of a food processor, pulse the crackers and sugar a few times until they are fine crumbs. While pulsing the processor, slowly drizzle in the melted butter. Pulse a few more times until all the crumbs are wet and all the butter is incorporated. Press into a 9" pie plate and bake for 13-15 minutes, until the crust is lightly browned and smells fragrant. Remove from oven and set aside to cool. In a medium saucepan, add the coconut milk, whole milk, shredded coconut, 1/3 cup of the sugar, and the salt. Whisk to combine over medium high heat and let the mixture come to a low simmer, stirring occasionally. While the mixture comes to a simmer, add the yolks, remaining 1/3 cup of the sugar, and cornstarch together in a separate bowl. Whisk together until smooth. When the milk mixture has come to a simmer, grab a measuring cup and measure out one cup of the milk mixture. Slowly drizzle the milk mixture into the egg mixture, whisking constantly. This tempers the eggs so they don't scramble when you add them to the rest of the milk mixture. The mixture should be smooth and warm. Add the tempered egg mix back into the saucepan with the remaining milk in a slow drizzle, whisking the entire time. Continue to whisk to make sure the filling is incorporated. Continue cooking until the mixture thickens and a few bubbles pop to the surface, it should take less than one minute. Remove the saucepan from the heat and whisk in the butter and the extracts. Stir well. Let sit at room temperature for 5-10 minutes, stirring occasionally, to help it cool down. Pour the filling into the cooled pie shell and smooth with a spatula to make it even. Wrap the pie plate with plastic wrap, making sure to press it down on the surface of the filling to prevent a skin from forming. Refrigerate the pie for at least three hours before serving. When you are ready to serve the pie, add the heavy cream and sugar to the bowl of a stand mixer (or use a hand mixer). Whip until the cream is stiff, about 3-5 minutes. Add the extracts and stir to combine. While the cream is whipping, toast the shredded coconut in a small saucepan over medium heat until lightly toasted, about 3-5 minutes. 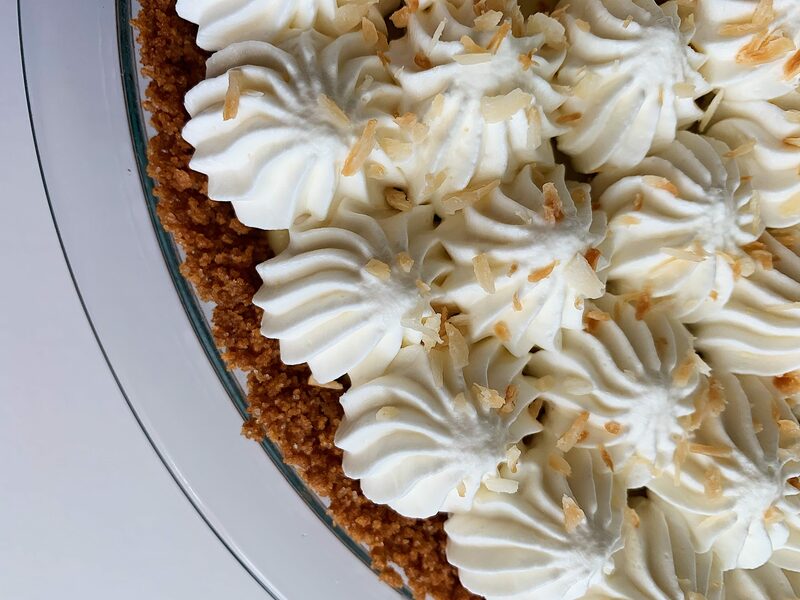 Spread or pipe the whipped cream on top of the pie, and garnish with the toasted coconut. Enjoy! recipe modified from this one by America’s Test Kitchen.